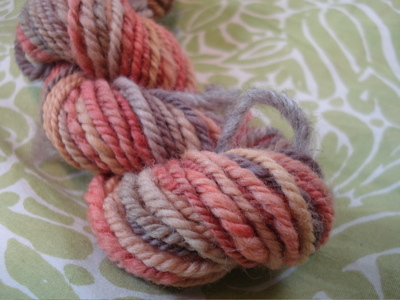 Hooray for handspun! 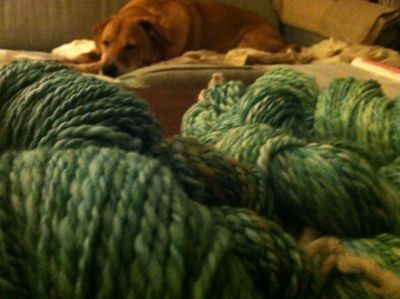 That’s about 450 yards of light worsted/worsted 2-ply, spun from Pigeonroof Studios merino in Bronzed Teal. Boh seems sort of interested, doesn’t he? Anyway, I’m excited! 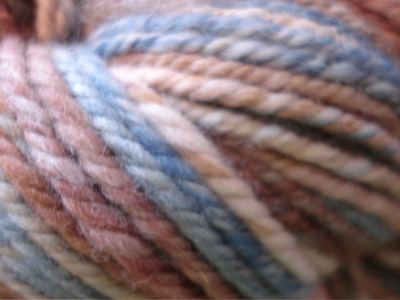 I have no idea what I want to make. 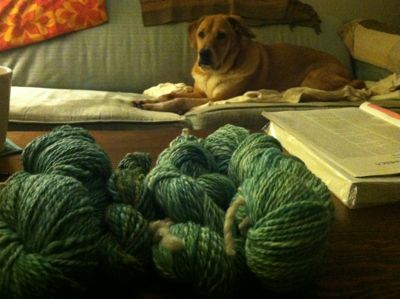 I’m not sure I can count on Boh to help me pick a pattern — what do you think? 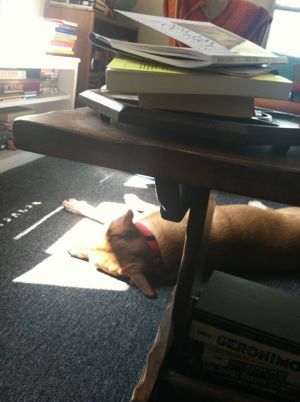 One more Boh shot: lounging in the sweet spot of sunshine. 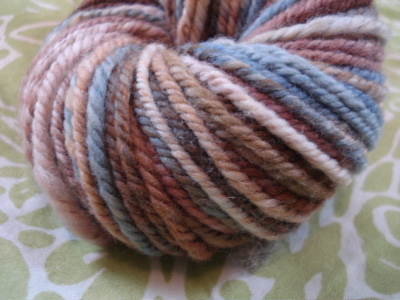 This is the second skein of cauldron/Rhinebeck, pre-soak. 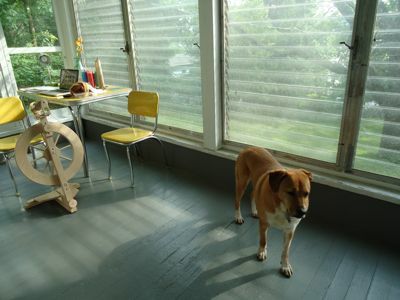 Boh and I spent more time on the porch yesterday: he surveyed the scene, ears twitching at every squirrel and chipmunk he spotted, while I picked out more fiber to spin. 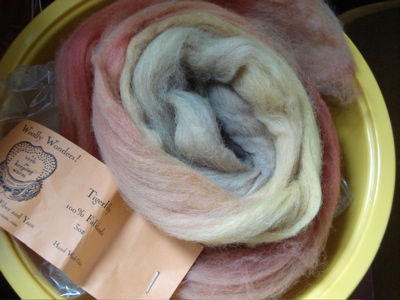 I managed to spin up both bobbins of Cosmopolitan, a Southern Cross Fibre Club organic merino. I’ll probably post a whole cluster of photos once I feel like I’m mostly settled here, but today I’ll share this shot of the guest room. 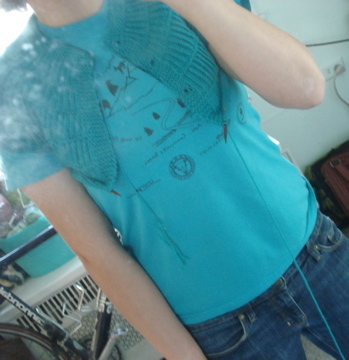 My mom is bringing me her old sewing machine, and I’m planning to put that in the corner underneath the windows. 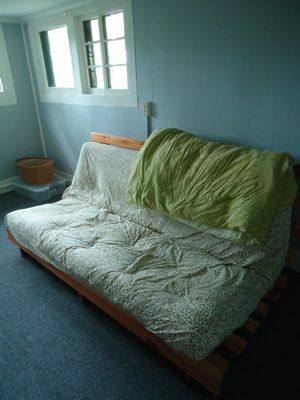 I like the idea of finding ways to use this room and enjoy it, even when I don’t have guests! 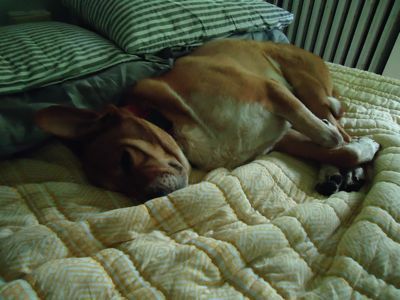 I snapped this picture of Boh right after I got out of bed — much later than usual — this morning. 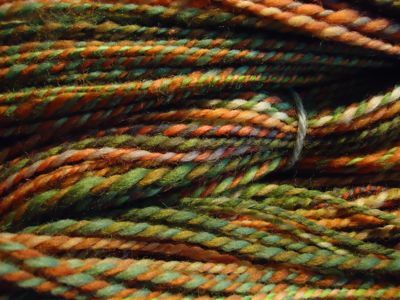 I’m still feeling a bit under the weather, and I’m hoping another day of porch spinning and lazing about the house will help me to shake this combination of head cold/seasonal allergies that’s had me feeling less than 100% this week. 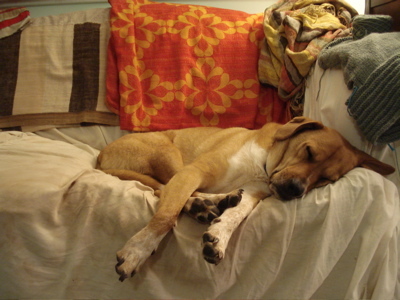 Sweet, sweet dog. Somebody has earned a stroll in the woods behind our house today. 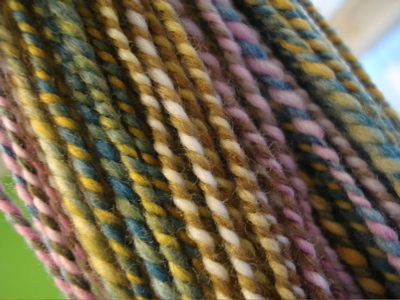 Yesterday I finished plying the Spunky Club corriedale in New Day. 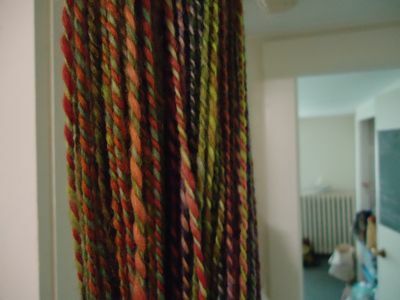 This stuff is hanging to dry, and should be all done by the time I get back from morning yoga today. 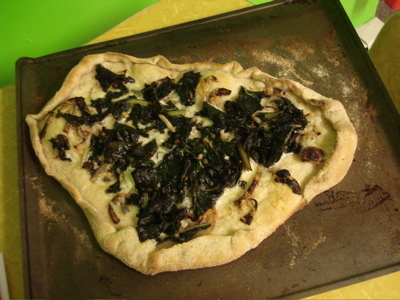 And this stuff — well, it just called to me yesterday. 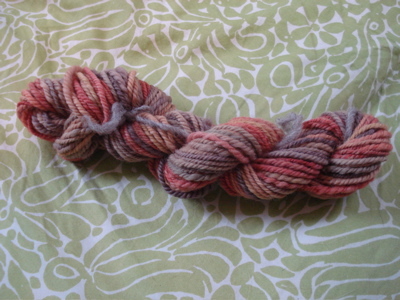 This is the first bobbin of Pigeonroof Studios Merino in the Chard colorway. 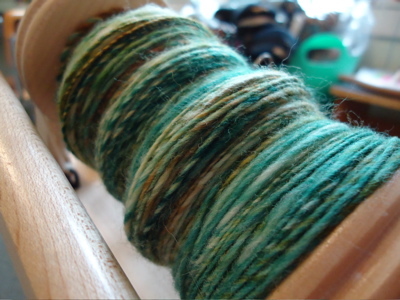 And this is the second bobbin. 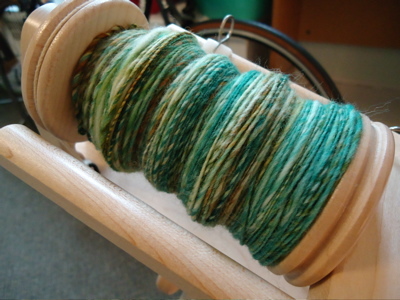 This stuff really did spin itself, and I am excited for the squishy 2-ply it will become. 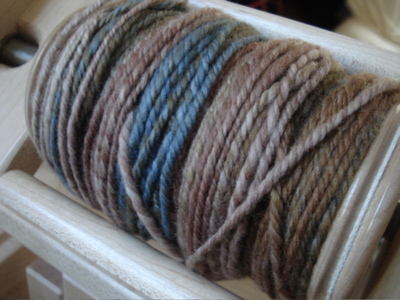 Remember that huge skein of Eco-wool I had on the swift the other day? 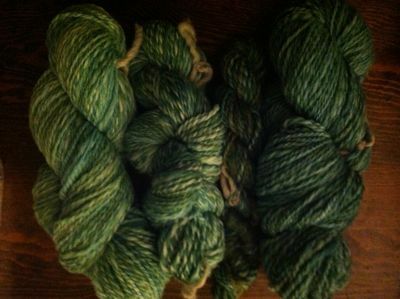 It is destined to become a Hemlock Ring blanket. 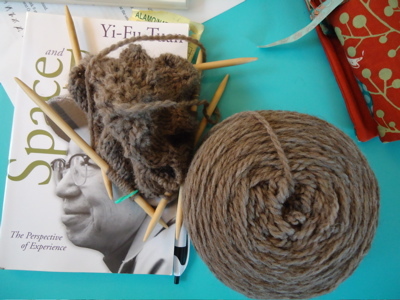 Jodi of A Caffeinated Yarn and I are doing a mini-KAL, and already I’m convinced that this project is building my lace confidence. 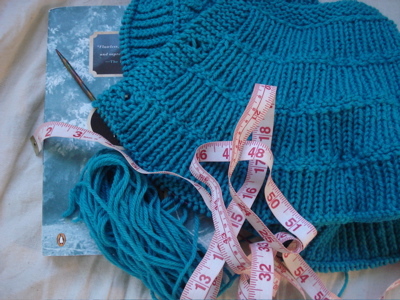 So nice to knit lace on size 10.5 needles! 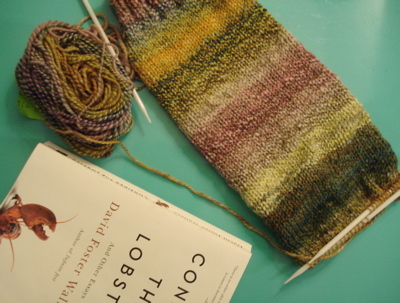 I recognize that this picture doesn’t necessarily reveal ANYTHING about the pattern, but I’m a bit further along now, at row 30. 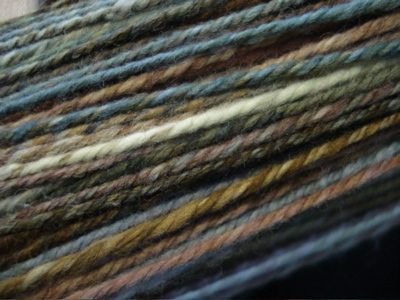 I am just about ready to transfer this to circulars, and then it will be both faster to knit on, and easier to conceptualize. I’ll snap more pictures. And then there’s this guy. 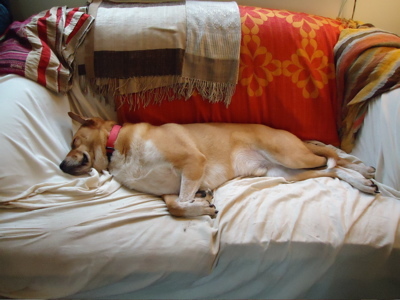 He didn’t do much of anything yesterday…except demonstrate that he really is long enough to take up the entire couch. 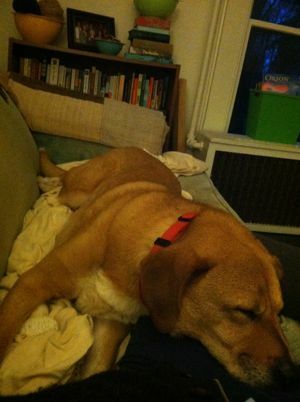 That’s my dog! 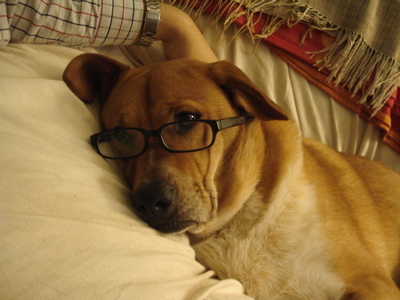 Boh: Umm, do these make me look smarter? 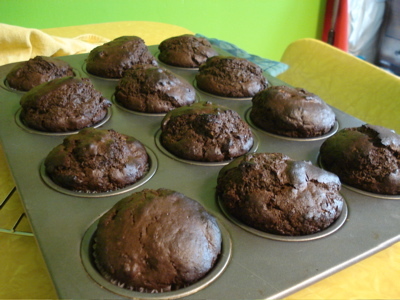 More playing in the kitchen this weekend: homemade pizza and these double chocolate muffins, with walnuts and almond extract subbed for the butterscotch chips and vanilla. 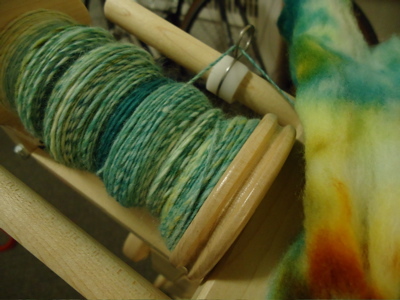 Also, some spinning. 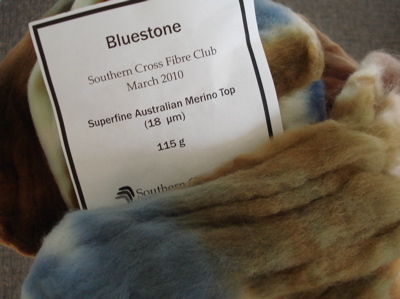 This is Southern Cross Fibre merino in Bluestone — my first club shipment! It arrived on Thursday, and by Friday afternoon it was on my wheel. 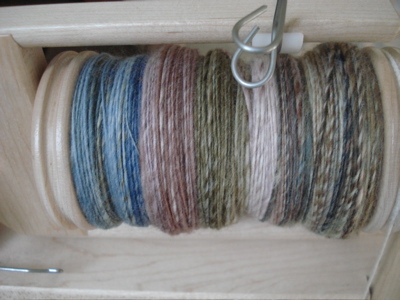 I spun all 4 oz. 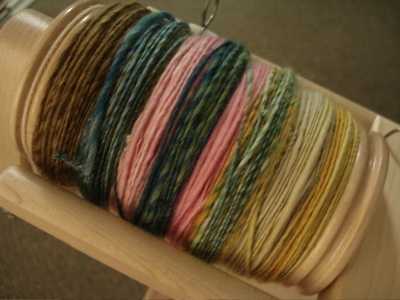 as singles, and this morning, sat down to navajo ply the whole lot. Shalom matches the book I intend to finish today! Happy Saturday, folks. 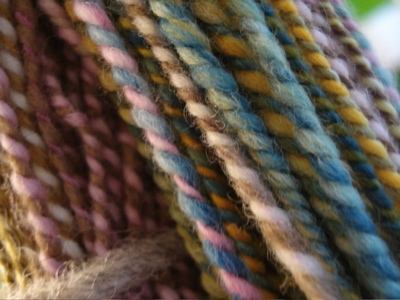 plying patchwork (all things P). 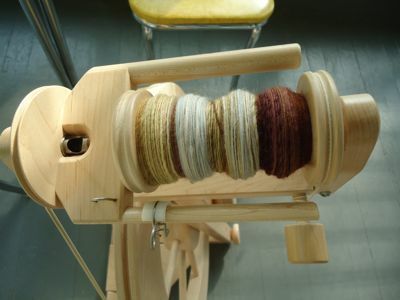 Boh was clearly instrumental to the plying process. 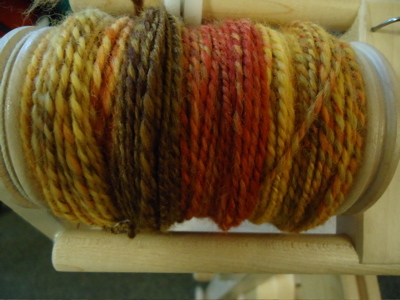 Here’s the second bobbin of patchwork singles, spun from the second bump of fiber. 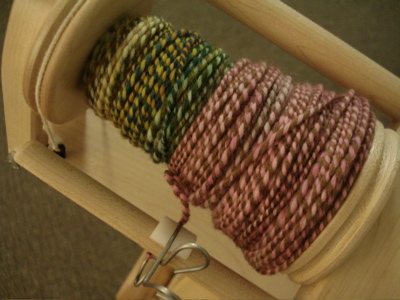 Skein #1, hanging to dry. 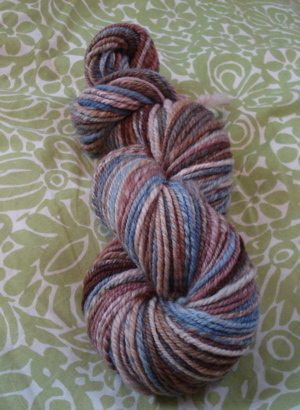 I gave this an extra long bath (okay, I sort of forgot about it), and the resulting 2-ply is particularly plump. Sigh. 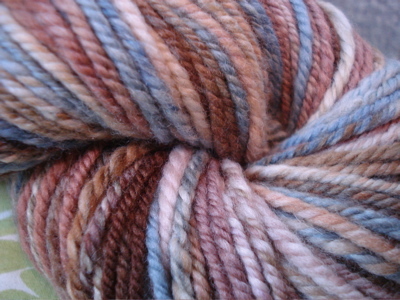 This first skein is about 150 yards. 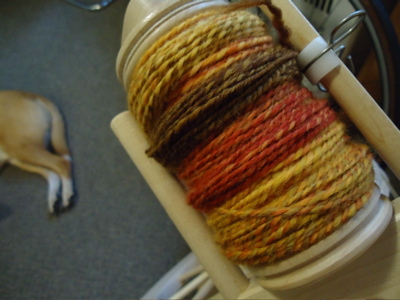 I might attempt to ply another bobbin’s worth before heading to campus this morning. I am in love with this stuff.